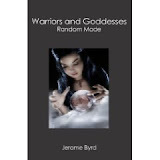 In Warriors and Goddesses: Random Mode, author Jerome Byrd picks up where his last book, Warriors and Goddesses: Full Moon, ended. On the planet known as Androgynous Prime, the adventures of Darkasan, a human abducted from Earth and taken to this brutal and unforgiving world, and the various alien female and male tribes of Warriors and Goddesses continues. In a world where primal instincts dictate actions, the plot of the story centers around the breakdown of tribal regions where all tribes struggle to survive and dominate a chaotic and violent society. As a continuation of the first book, violence, the use of sexuality and sensuality as powerful weapons, revenge, and primal lusts are predominant themes integrated within the struggle for power and control of a lawless society. New themes that are introduced in the storyline include the evolvement of such emotions as love, compassion, and the struggle to acknowledge and accept the need for cooperation among tribes in order to achieve some sort of primitive system of tolerance. Jerome Byrd is very successful at maintaining the consistency of characters from one book to the next. As well, character development is well plotted with emerging qualities that include fear, hope, and love. As with the first book, the violent and sexual imagery are better suited for adult readers. With the continuation of the series, I would like to see how the tribes evolve from primitive sexual violence as a way of obtaining power to more of an intellectual quest for a civil society. Because the story picks up where the last book ended, it may be helpful to read the first book, Warriors and Goddesses: Full Moon, to obtain a better understanding of Androgynous Prime and its alien inhabitants. As a story that blends Dark Fantasy with Science Fiction, Warriors and Goddesses: Random Mode is a page-turning story that will be enjoyed by science fiction and fantasy readers.